If you are a CAD blogger and are wondering whether people consider you as a member of the CAD press, one sure shot way of knowing is to check if you receive press releases from CAD vendors and their PR companies. I have been receiving my fair share of press releases for quite some time now, even though I rarely mention them on this blog. Recently Autodesk PR sent me a press release about motorcycle manufacturer Wild West Motor Company dumping SolidWorks for Inventor. Something in that press release intrigued me. Not what was said in it, but rather what was left out. Of course, there is only so much that you can pack into a press release. I know because I write SYCODE’s press releases myself. Deelip: I am curious to know how you managed to solve the problem of moving your existing data (native SolidWorks part and assembly files) over to Inventor. The press release mentioned that Wild West is currently working on a new high-end motorcycle. Are you using Inventor for this and all future models only? Or are you using Inventor for all your existing designs as well? Jim: Most of what we have used in the past is in the hands of our outside contract machine shops and fabricators. All of those parts will stay the same because the shops would have to reprogram their machining to update to the new files. It does not make sense to change. Our new line of hybrids will require much more design. In saying that I mean that each new model will have to have a new frame assembly as well as sheet-metal (fairings, etc) to represent its own style. This time all assembly drawings will be completed prior to manufacturing. This would include all frame parts & assembly, wheels, wiring/electrical and run a stress analyzes. Plus we will need to put each model into finished paint and graphics and give them a showroom for display to our dealers and any group we would want an endorsement from. Deelip: Autodesk PR tells me that Wild West recently made the switch from SolidWorks to Inventor and is “going through the transition process realtime”. Can you briefly describe the processes and plans involved in this transition process? Is Autodesk and/or its reseller helping you in this process? Any other information or tips that would help users making or intending to make a similar switch would be greatly appreciated. Jim: In order to meet the goals I talked about above, we will have to use several different software’s. All the software’s we need at the present time have been provided to us by Autodesk. And as you no doubt can understand we also need training in order to get the best out of each software. 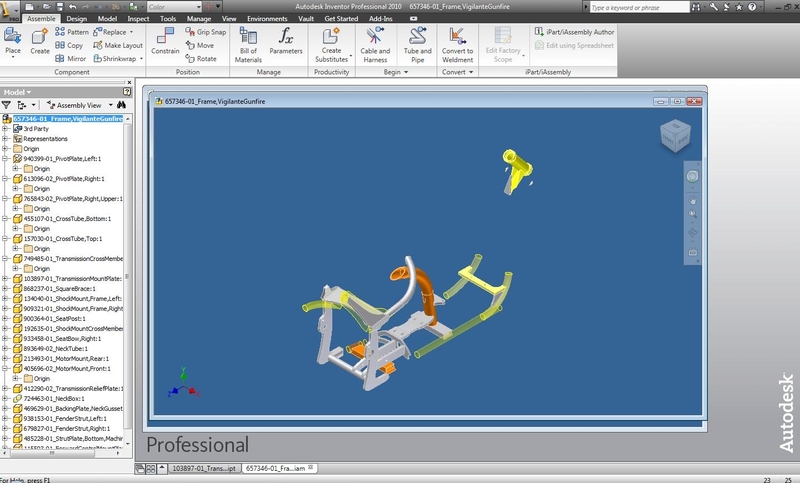 Training is being done at our local Autodesk Dealer (Advanced Solutions Inc). We feel that they are highly competent and are certainly rated as one of the best dealers and trainers in the country. Deelip: The main reason for moving from SolidWorks to Inventor appears to be Inventor’s Digital Prototyping tools. I am curious to know which of these Digital Prototyping features were lacking in SolidWorks or its partner solutions or why they could not suit your specific needs. Jim: The reason we left SolidWorks and moved to Autodesk is because we felt that Autodesk took more of an interest in what we are trying to accomplish. When we sent a call for help Autodesk stepped up with the solutions and support to allow us to move to the next level in both our technology (model designs) and manufacturing. Deelip: With Inventor Fusion, Autodesk is morphing Inventor from a strict history based parametric modeling system into a direct modeling system with history and parametrics. On the other hand, SolidWorks has publicly stated that it will not go down the direct modeling path, but will enhance its Instant3D feature instead. Did these positions by Autodesk and SolidWorks influence your decision to make a switch from SolidWorks to Inventor. Deelip: How many licenses of SolidWorks did you convert to Inventor? Do you still continue to use SolidWorks in a limited capacity? Jim: At this time we have only three (3) workstations, two in Kentucky and one in Georgia, all stations use Inventor and we have discontinued the use of SolidWorks completely. Jim promised to keep me updated on the progress of adopting Inventor at Wild West. Hence the title of this post has a “Part 1” in it. I hope to follow this story and post updates on how the switch from SolidWorks to Inventor worked (or did not work) for Wild West Motor Company. Nobody from Autodesk or its PR company was involved in our conversation. Autodesk PR simply facilitated the conversation. This was a direct one-on-one conversation between me and Jim and I intend to keep it that way. Jim sent me a screenshot of a Work In Progress of one their frames. Not that pretty yet. But if all goes according to plan then I guess it will soon turn into something like this. I hope to one day ride one of these beasts. There is something about these machines that drives me crazy. The other day a friend sent me a PowerPoint slide show which had a bunch of slides, each containing a gorgeous half/full naked supermodel on one side and a breathtaking picture of a car on the other. The slides flipped quickly and the last slide asked me whether I had noticed the women. As it turns out, I had not. My first reaction was to look at the cars. Which makes me wonder what my reaction would be if there were cars on one side and bikes on the other. I guess that would be stressing my brain a bit too much. But I must admit, the second time I ran the slide show, I did notice every detail of the women. I guess men will always be men.